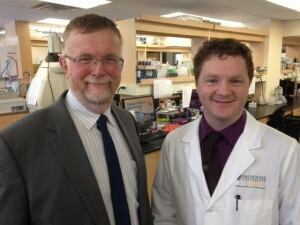 A Saint John company is exploring ways to extract heavy metals from contaminated water and help industry with one of its most costly and challenging problems. NB BioMatrix hopes to have its Naqua Pure product ready to test on a large scale by the spring. "It's sort of like a really small sponge that you can throw into the water, that cleans up the water," said BioMatric co-owner Keith Brunt. "And then we can pull those sponges out of the water, and we can sequester those heavy metals away." The industrial contamination of water with heavy metals is the most costly and challenging problem for commercial water remediation. Heavy metals are dangerous to human health when they accumulate in the body. Since they occur at the nano level, they clip through most membrane-based filters. Many industries currently dump contaminated water into well holes drilled below the water table, or boil it at great expense to concentrate the heavy metals. Both practices cost industry up to $700 million per year. "It's got a market potential that's fabulous, and it is good for the environment, so we're running with it," said Brunt. Brunt's company is one of the finalists in this year's Breakthru competition put on by the New Brunswick Innovation Foundation. The winner will be announced Thursday.